The state representative touted state action on the opioid 'epidemic,' among as other achievements. 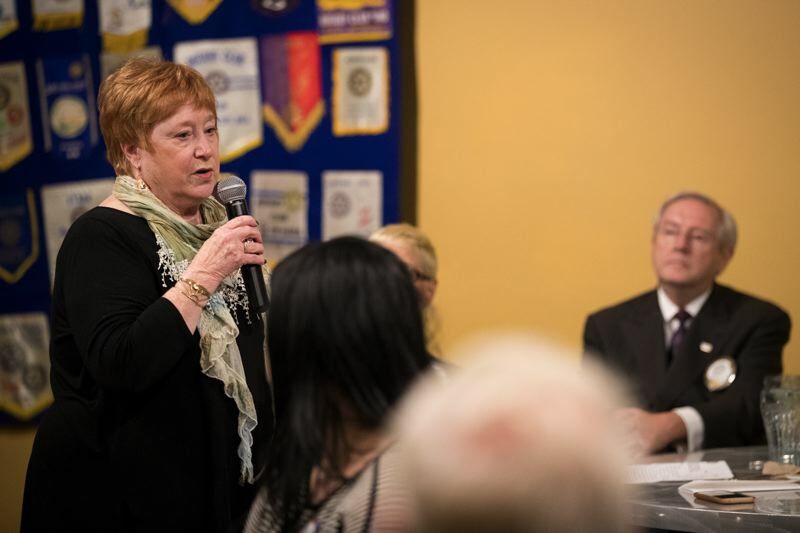 At a Rotary Club of Tigard luncheon Thursday, Oct. 26, state Rep. Margaret Doherty responded to President Donald Trump's designation of opioid abuse and addiction as a national emergency, agreeing that it has reached an "epidemic" level and pointing to the Oregon Legislature's work this year in attempting to limit prescriptions of opiate painkillers. 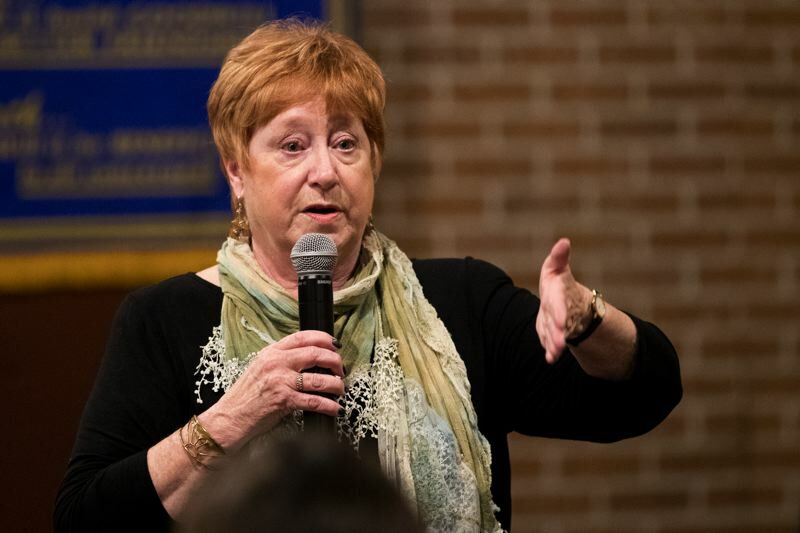 Doherty, a Tigard Democrat who has represented House District 35 — a district that includes Tigard, Metzger and parts of Beaverton and Southwest Portland — since 2009, chairs the House Education Committee. She spoke about legislative successes from this year Thursday and also fielded Rotarians' questions. One attendee asked about President Donald Trump's declaration Thursday of a "nationwide public health emergency" to address opioid abuse and addiction, and whether it could be used as cover for a federal crackdown on states like Oregon that have legalized marijuana. "Well, they want to," Doherty said. Attorney General Jeff Sessions has publicly criticized marijuana legalization, and several Trump administration officials have described marijuana as a "gateway drug." Despite studies finding that marijuana can be safely used to address chronic pain, the federal government has classified it for years as a Schedule I controlled substance, meaning it has no recognized medical uses. But Doherty agreed with Trump that opioid abuse has become a national emergency. The president noted Thursday that opioid addiction affects many segments of the population across the United States. Many people become addicted to opioids, a family of powerful painkillers derived from the opium poppy that includes heroin and morphine, after having it prescribed to them by doctors. "The one thing about the opioid (crisis), and it is an epidemic, that we've been trying to deal with in Oregon and dealt with in the last session is the amount of OxyContin or something that you can prescribe for the whatever you had done with you," Doherty said. "We've had people that had surgeries that were getting like a three-and-a-half-week prescription for it … and they only needed it for maybe four days." She added, "It is an epidemic. And so what we're trying to do is go through and … limit the number of pills that you can prescribe." That experience of having opioids overprescribed was echoed by another attendee, while another said his elderly mother has benefited from a medical marijuana prescription, reducing her pain. Board of Nursing and the Oregon Board of Dentistry to provide opioid prescription guidelines and recommendations to medical practicioners in the state. The Oregonian/OregonLive reported in July that federal statistics show that the rate of seniors hospitalized due to the adverse effects of opioids is higher in Oregon than any other state in the nation. Multnomah County, Oregon's most populous county, declared opioid prescriptions a "public nuisance" in July as well and announced a lawsuit against Purdue Pharma, which manufactures OxyContin, one of the most widely prescribed opioids for pain management. Doherty spent just a couple of minutes Thursday talking about opioids and marijuana. Her presentation was devoted mostly to reviewing the 2017 legislative session. A former teacher, Doherty championed the Legislature's work this year on the public education front. "We passed a balanced budget … but it maintains historic investments to education that we've made in the past two biennia," Doherty said. "In fact, what it was was $8.2 billion out of our budget that was dedicated to (kindergarten) through college education, which was probably one of the very few budgets that had an increase. It was increased 11 percent over the last biennium." One of Doherty's legislative priorities is improving services for at-risk and homeless youth. She keeps track of former students, including three she said spent time in prison years after passing through her classroom. "Once you're a teacher, you're always a teacher," Doherty said. "And whether the kids are 58 — which, a lot of my students are now grandparents — they're always our kids." Oregon lawmakers did away with reduced-price school lunches in 2015, voting to extend free lunches to all students who previously qualified to buy lunch at a lower cost. Doherty explained the reasoning behind that decision and how it has actually ended up as a net boon to the state. "We had nutrition people that were coming to us and saying, 'We've got kids that are bringing their 40 cents, and it's got lint in it because they got it out of the couch,' or, 'They don't have the money, and because they don't have the money, they have to give them a sandwich instead of a regular lunch,'" Doherty said. "So we did a little research and found out that we could feed these 30,000 children for about two and a half million dollars a biennium. But because more and more of the students are using the reduced lunch, which is now free, we actually got $5 million back from the federal government nutrition program." Doherty touched on the state transportation package that the Legislature approved this year, which includes funding to add lanes to Highway 217 between Beaverton and Tigard, as well as to improve Capitol Highway in Southwest Portland. "Two-point-three million dollars was specifically for the Capitol Highway project, and that's from Barbur Boulevard down to Multnomah Village, because there is no infrastructure," Doherty said. "We fondly refer to it as 'the goat path' on Capitol Highway." One transportation priority that was not fully addressed by the Legislature this year is Interstate 205, which local and state officials have long said is in need of widening east of Tualatin, between Stafford Road and the George Abernethy Bridge. The transportation package included provisions allowing the state to explore making I-205 a toll highway, revenue from which could pay for the desired improvements — but Oregon would need to obtain federal permission to actually institute tolling. "I don't know how that's going to end up," Doherty admitted. Another Tigard-area road that is a common source of complaints from residents and commuters is actually a state highway as well, Doherty noted. The Oregon Department of Transportation has jurisdiction over Hall Boulevard between Scholls Ferry and Durham roads, a stretch officially designated Highway 141. "After the snow last year, there were a couple of potholes — a lot of potholes — on Hall Boulevard," Doherty said, referring to a series of winter storms in December and January that carpeted the Portland area with an unusual amount of snow and ice. "The joke in the city was, 'You know that somebody's drunk because they're driving straight down Hall Boulevard and they're not bobbing and weaving.'" ODOT is currently in the process of finishing up a safety project on Hall Boulevard just north of Highway 99W. A mid-block crosswalk there has been upgraded with a median island. When complete, pedestrians and bicyclists will be able to activate a flashing beacon to alert drivers to when they are crossing the boulevard. The Rotary Club of Tigard meets weekly at Nicoli's Grill & Sports Bar in Tualatin, 17880 S.W. McEwan Road. The club regularly invites speakers from the community to talk about issues of interest.